Frank Mason ranks in the 94th percentile in rebounds among DI players 6' and under. I explained how I acquired this dataset here. 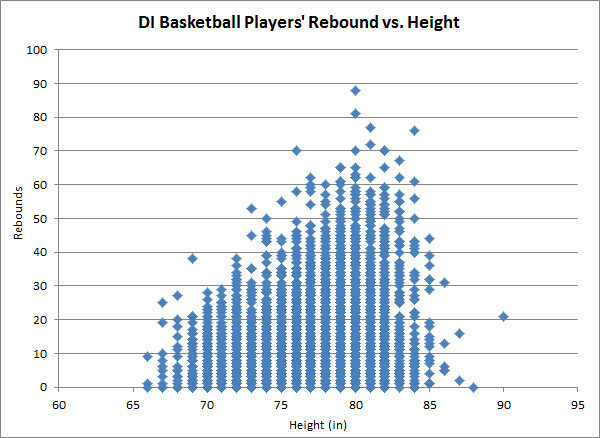 In my last post, I obtained a dataset of all DI college basketball players and their to-date rebounding numbers. I also promised an analysis would follow. Here it is! Since this dataset is simple, just 7 columns across just under 4500 rows, I’ll use Excel. This is the sort of analysis Excel, well, excels at. The impetus behind this series of posts was Kansas’s 5’11” sophomore guard Frank Mason pulling down 10 rebounds against Michigan St. this past Sunday. Guys that size couldn’t possibly be capable of grabbing rebounds, right?? 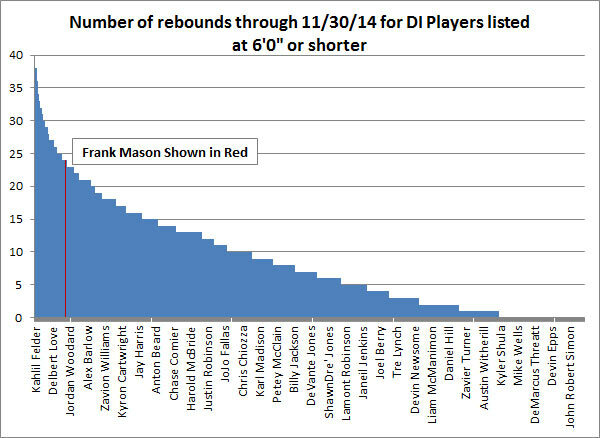 Well, what the dataset shows is that of the 543 DI players listed at 6’0″ and shorter, Mason is tied for 24th most. Not too shabby, but a far-cry behind the leaders Kahlil Felder and Isaiah McCray–both with 38. 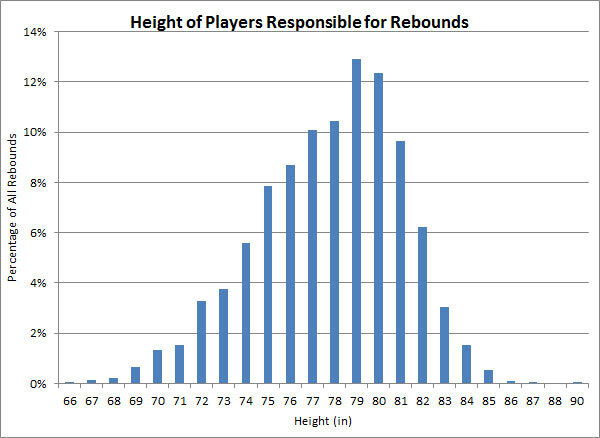 Not surprisingly for an accumulating statistic, the number of rebounds for these players follow a non-normal, or non-Gaussian, distribution. With that in mind, Mason’s rebounds are in the 94th percentile among players listed at 6’0″ and under. If the player pool is expanded to all DI players, Mason still ranks in the 77th percentile! I could have stopped here, but I thought it might be fun to look deeper into this dataset. After all, height and weight values were scraped for a reason; I was curious how well they correlated. In this particular case, the coefficient of determination (R squared value) showed a slight bias toward an exponential fit. I didn’t check if it’s a statistically significant difference, but the point here is that there’s enough of a correlation to back up my theory that most basketball players are built the same – the taller players are just scaled-up versions of their smaller teammates! 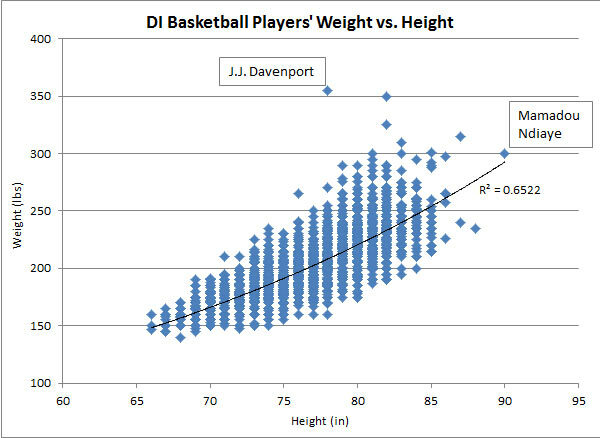 For those of you curious about the outliers, the heaviest kid in college basketball is J.J. Davenport. The tallest is Mamadou Ndiaye. 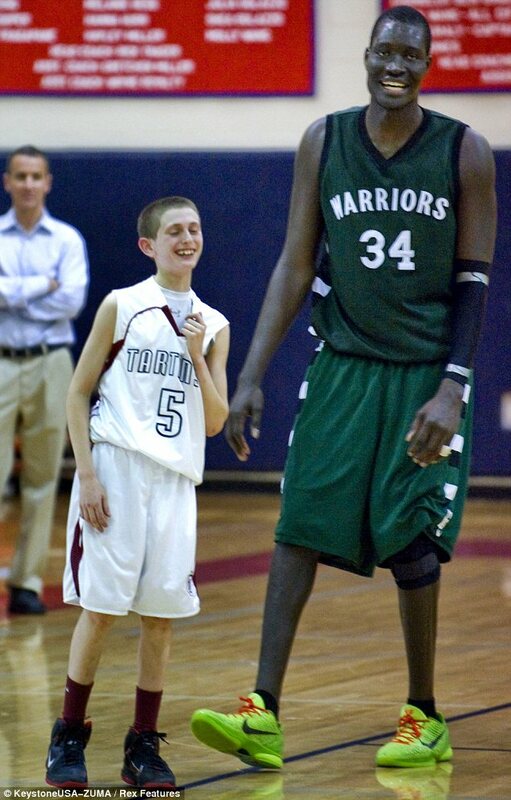 No, not that famous basketball-playing Mamadou Ndiaye this Mamadou Ndiaye. 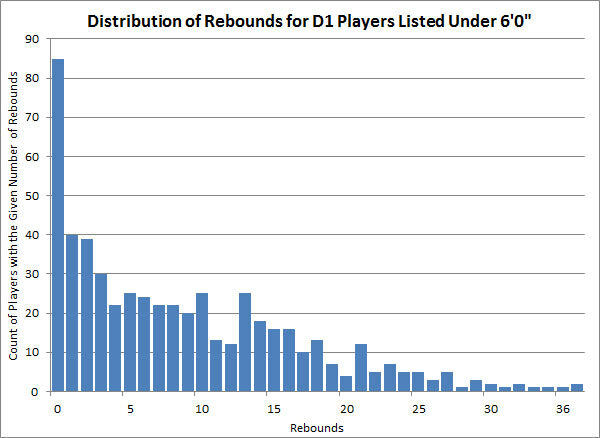 Furthermore, I wondered whether or not taller players more inclined to get more rebounds. My intuition says ‘yes’ (which is why Masons’ rebounding total was so surprising to me in the first place). The data agree with me, though I chose to omit the coefficient of determination on this graph since the high number of players with relatively few rebounds significantly skews the data. The smart thing to do here would be to filter out the players with very little playing time, but I didn’t scrape playing time when I collected the data. Whoops. Let’s say you’re a coach looking to recruit a rebounding machine based on nothing more than height. How big of a player do you go after? You definitely don’t want a guy of Mamadou’s size. He lacks the right combination of agility/strength/speed to be a force on the low block. 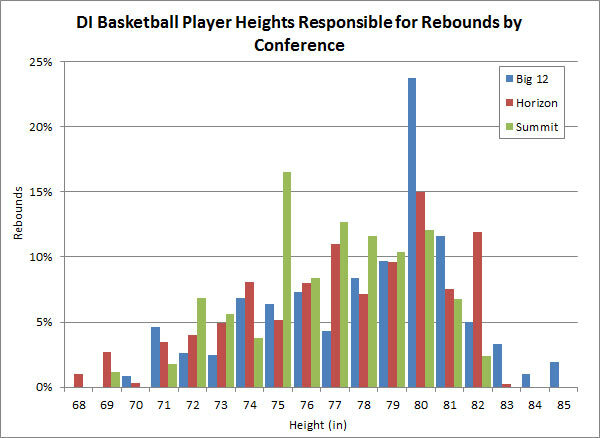 This dataset indicates that players at 6’7″ and 6’8″ are responsible for the lion’s share of rebounds, but I have a feeling this has to do with the sheer quantity of players in that size range. A more valuable metric would take this into account. If any coaches happen to read this (hah), wait for the followup post before you go changing your recruiting strategies! Despite the deficiency of this calculation, I looked at how this metric varied from conference to conference. Even though we’re still a long way from conference play, I compared Frank Mason’s conference (Big 12) versus the conferences of both Kahlil Felder (Horizon) and Isaiah McCray (Summit). Interestingly, 6’8″ players dominate the Big 12, while 6’3″ players are responsible for the largest percentage of rebounds in the Summit league. Rest assured, I will continue to investigate this. 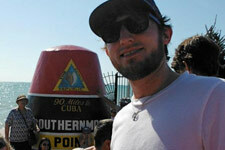 Andrew is currently a mechanical R&D engineer for a medical imaging company. He enjoys good food, motivated people, and road biking. He has still not completely come to terms with the fact he will never play center field for the Kansas City Royals. I have thousands of interests, I enjoy collaborating with motivated people, and I strive to never be out-worked! Just overheard in the thickest New Zealand accent imaginable: "When I was a teenager, I had a crush on my cousin Bruce."